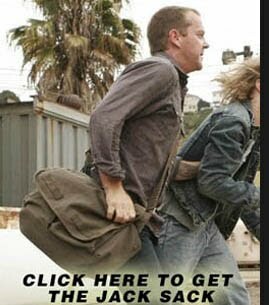 The Jack Sack™: Where are you, Jack Bauer? There's always a time to let go of something. I don't know it that's useful or helpful in any way, if you already knew that, or if I'm just depressing the hell out of you and everyone else on this site. It's just something to consider. 24 has ended, and while there may've been sites that ended with it, you kept your ground and tried to continue it. I just want you to know that you don't have to. Happiness is a complex thing. There can be a difference between happiness and freedom. You sound like you might be looking for freedom, and this might be a hard journey to take, and you might have to abandon a thing or two to get going. But that's just my opinion. If you love this site enough to continue with the largest of plesure, do so. Plus, ya know, we're fans without lives, so we'd like that. That being said, I would honestly like to tell you that if you stopped or cut down on writing 24, I would be very disappointed, especially since we're in the middle of a season. I personally love the way you write, and wouldn't change anything about it. And Spencer's right, while other 24 sites shut down, you remained faithful to the show, another thing I love. HOWEVER do not think in any way, shape, or form that I will not COMPLETELY respect whatever you want to do. I just want to give you an honest opinion of how I feel, as a reader. I cannot thank you enough for the joy, laughs, and tears of laughter you've given me with your amazing writing on all things 24. Sorry, my computer froze up in the middle there. I was going to say that when I first discovered this site, it was like finding buried treasure, and I read almost all the site in three hours, I was so hooked to this amazing writing. Glad you found you some happiness. P.S. This is not a goodbye, btw. I like Alex's idea. Outsource an episode when you're finding that you don't have anything to say. Please be patient with your creative writing and don't run off to become a mime. Sometimes even mimes run out of things NOT to say. I was just talking about this website on a 24 message board. We were lamenting the closing of the FOX board and Benny's Blog but I said at least we still have Jack Sack to reminisce about the good 'ol days. Well, Adam, if you feel like you might want to exit this site, I don't think you should do it immediately. I just think that if you're in a state confusion, you should consider all options and directions that you could go. Gang- I'm not abandoning the site- I hoped to make that clear in my post. As for the idea of guest posts- I'm open to that, but I want to put some editorial guidelines out there first: Basically keep to what I've said about comments- don't cross the lines we've talked about and be otherwise creative. Just ask yourself "Would Adam delete this sentence?" You know what I'm all about. So-- I invite you to discuss among yourselves and divide up the next few reviews. When you write them, just email them to: thejacksack@gmail.com and I'll post them-- and hopefully with no edits ;) Deal? So let me get this straight- we can review some of the episodes for you? I'd love to do this. Reviewing a whole season and be funny would be a disaster for me, but I might be able to review an episode or two. This is what I'll do; We're on episode 12, right? I've just finished re-watching season 5, so I can go from episode 12 through the rest of the season and decide what episode(s) I'd particularly want to review, and like you said, we'll all talk and settle who'll do what. BauerLuver, I hate to give advice to someone who could very likely be older than me, but it's all about what you think, and whether or not you're satisfied with what you've written. As long as you think that you stuff's funny, it doesn't matter if other people don't like your humor. I don't think I'll be much aid in the quest for guest reviews, however; I'm more the 'reacting and commenting' type, myself. Awesome way to band together though, gang! It makes my heart swell with Jack Sack love. Go team! But I might try writing a review if needed, or maybe just to give it a shot!! I'm already on episode 14, and I think I'll find one or two that I really want to review, but hopefully we can figure this out. The last episode he's reviewed was 11. Yesterday, I watched 12, 13, and 14. I'll probably knock off a few more tonight, but so far I'm suprised and a little dissapointed at how little I have to say so far. But I do have to ask this; can I do the season finale? In that case, if someone takes 12, I'll take 13. I think I can swing that. Yahoo seriously. Alex- Of the three episodes I've seen, 14 is the one that I feel like I could review the easiest. However, if you want to review that, it's cool with me. But yeah, please guys, review 12 and 13, lol. Hmm, you know what, I'm feeling adventurous tonight, and maybe I'll sign up for a review. Do you guys need ep. 13 done? I think I'll do it!! Oh wait, Alex has that one. So either episode 15 or 12 if nobody else wants to do 12. BauerLuver- I could trryyy doing 12, but can I at least watch episode 15 tonight and make sure that I wouldn't absolutely love to review it? That's cool. I'm down with whatever, BauerLuver. If you want to do 13, go for it. I'm just not sure I could do 12 within a reasonable amount of time considering some personal stuff I have going on this week, but 13, 14, or 15 is completely feasible for me. Awww!!!!! This makes my heart gush with happiness. I kind of feel like we're in the midst of a social experiment (Lord of the Flies, anyone? Those miners in Chile?) where the environment (or the nature of the game) is changing and therefore new 'societal' structures must emerge. But instead of falling apart in chaotic dissonance or abandoning ship, it's like a new mini government is forming right before our eyes! Freakin' A. The geeky part of me just thinks that's so ridiculously cool!!! Way to rock my freakin socks off, guys. Ok, i feel best with ep. 13 but I'll try twelve if I must. And thanks, brittany! Gee, I have an idea. Why don't we just declare that there's a longer time window for the 1st guest review (ep12), and that way nobody has to feel pressured to give less than their best effort? I'm game for being patient. @Brittany- that's a good idea. And can I say that I love your awesomenes? I personally look forward seeing how this works out. You guys could make some really good reviews. BauerLuver - 13 is yours. :) I will take 14. However, your first born must be named after me. ;) Have fun with 13! @Alex- haha indeed he will be!! But you might have to wait awhile cuz I dont plan on getting married for a long time!! Seriously tho, thank you!! Is Spencer doing 12? I tell ya what, if everyone's ok with it, I'll write a review of 12 tonight and send it to Adam's email. That sound great Spencer! Thanks (I can't wait to FINALLY move on with the episodes)!! I look forward to you guys reading my review. So far I've been carefully watching through the episode while writing it. It'll be finished and sent to Adam's email by tonight, so hopefully he'll post it on this site tommorrow. That sounds great! Hope he gets it up by the usual time, too. Sweet molasses! I'll do my best to get 14 in the pipeline soon! @Alex- Take your time. I look forward to reading it. And not that it's a big deal, but do we have a definite person for 13? I'm doing thirteen, if that's ok.
And also, I was wondering, is this a once-every-Monday thing, or do we just give it to Adam and he posts it any random time? I'm wondering that, too, and sure you can do 13! First, Wow-- this is exciting! I can't wait to read your reviews- I am thrilled that you've taken up this venture. Alex- great idea, man. And the rest of the gang, I am truly amazed at your willingness to step up. Second, I'm happy to post reviews more than once a week- I'll probably let a review live on its own for at least 2 days to give the author his or her time in the sun. How does that sound to you all? @Adam- That'll work. I'm making good progess on my review, which is the next episode, so it'd be great if you could take the time tommorrow or the next day to post it here. This is awesome! More 24 in less time! That sure is a win-win situation. @Adam - Thanks, I'm glad you liked the idea! Sorry guys, it's taking a little longer to write the review than I expected. I'll finish it once I get home from school. Alright, the review's finished and has been sent to Adam's email. Great!! I think I'll start watching the episode now. The blog lives again- Spencer's review is up! Sorry I haven't gotten around to writing... I too have been very busy in mostly good ways lately. As someone who studied writing and someone who studies therapy (and someone who hopes to bring the combo of writing and therapy to the masses someday as a career possibility), I absolutely understand what you're saying. The need to write comes and goes for a lot of people. Like you, I tend to write when I have a lot of stuff I need to work out, whereas when I'm pretty content (and/or really busy), I don't feel the need to pick up the pen. And even if I wanted to write in those moments, it would just be... hard. You can't force inspiration. It just doesn't work that way. I have no doubt that at some point in time, you will feel the need to write again (although hopefully you'll still be on your lucky streak and just have inspiration gleaned from some other source). We will all be waiting for you with open arms, whatever it is you choose to write about. Thank you for the years of service you've given to blogging, to the 24 community, and to us, your faithful readers. For now, I'm excited to see what guest blogger Spencer brings!